The first sign of the long-suppressed dissatisfaction of the Hungarian people with a repressive and an economically inefficient regime appeared on October 6, 1956, at the ceremonial reburial of Laslo Rajk, a former cabinet minister who had been wrongly accused of various crimes and executed. This mass discontent exploded on October 23 in Budapest, with a large demonstration calling for political and economic reform. Encouraged by the reform-oriented Polish politician Władysław Gomułka's success in gaining appointment as head of the Communist Party without invoking a harsh Soviet response, and after a summer of Polish demonstrations against the party-state, students at Budapest Technical University formulated a list of demands known as the ‘16 points.’ The list included a call for the withdrawal of Soviet troops from Hungary and the restoration of a multi-party system. On October 23, at 3 p.m., the demonstrators met at Bem Square where a monument honored a Polish general who had aided Hungarians in their 1848 fight for freedom. From there, they headed to the Parliament, to the Radio Budapest building, and to City Park where a statue of Stalin dominated the area. On their way, the marchers were joined by citizens coming off their shifts and their number rose to tens of thousands. The crowd called for the re-appointment of Imre Nagy, who had been forced to step down in early 1955 for his reformist views which Moscow feared could jeopardize Soviet political and economic control on the country. However, the development of events showed that the replacement of Ernő Gerő with Nagy, who assured protesters of his intention to reform Communism, was no longer enough to calm down public discontent with the authorities' unresponsiveness to their grievances. Even the first intervention of Soviet troops could not scare the angry demonstrators, and their uprising turning violent as street fighting broke out between a poorly armed crowd and Soviet heavy armor. At the same time, new institutions began to be formed such as workers’ councils to replace party authorities with local management. An independent media network sprang up, spreading information about the revolt not only within Hungary but also into its neighboring states, including Romania. The documents posted on this web site today refer to the echoes of the 1956 Hungarian revolt in Romania, exposing the origins, the trajectory and the outcomes of the Romanian students' movement, a topic which was little approached in the English literature after 1990, and before then mainly through investigations of public documents and articles whose findings could be biased due to official propaganda. This research also aimed to reveal a new perspective on the relationship among Socialist states by investigating the role played by Romania during the Hungarian revolt, when the country was led by Gheorghe Gheorgiu-Dej, a Communist known as 'more Stalinist than Stalin' in a historical period marked by Khrushchev's ‘Secret Speech.’ The 'myth' of Romania's 'independent course' as an outcome of these events was already de-constructed by findings testifying to the docility with which Bucharest accepted not only to 'host' Nagy, but also to extend the 'temporary' stationing of Soviet troops on Romanian soil. With a party lacking national support, Romanian Communists were not in a position to argue with Moscow on this point. Even in 1958, when the Soviets finally withdrew their garrisons, the decision belonged exclusively to the Kremlin, as part of Khrushchev's game within the Cold War. What happened in Romania? The news about the protests taking place in Budapest reached Romania from the very start – first through the large Magyar community that inhabited the area bordering Hungary and enjoyed regular communication with their relatives in the neighboring state, and hence were well and rapidly informed of what was happening there. In subsequent days, Romanians from across the country and from all social backgrounds came to follow events assiduously by listening to Radio Free Europe or Voice of America, and later Radio Free Kossuth. The events started to be debated all over the country. Questions were raised about the policy of collectivization, with peasants asking if it was right and necessary. Workers began to complain loudly about their low incomes, and they expressed fears that the Soviet Red Army would crush the demonstration in Hungary due to a rumor that Soviet units stationed in Timișoara left Romania in the morning of 24th of October heading towards Hungary. The onset of national turmoil could not have been totally unexpected in a country run by a leader who claimed that de-Stalinization had ended in Romania with the elimination of the so-called ‘Muscovites’ (Ana Pauker, Vasile Luca and Teohari Georgescu) from the party and government. In fact, their purge took place in 1952 because they could have jeopardized Dej's position as 'supreme leader.' Moreover, after the 'Secret Speech’ episode, Dej was the one who ordered the elimination from the party of any activist who dared to criticize the leadership in the light of Khrushchev's new vision on the 'cult of personality.' Romania was also a country where the reality of everyday life was far from the image of the grand success consistently promoted by Communist propaganda: Romanian agriculture was in chaos as a result of forced collectivization and Romanian industry was burdened by the export of the country’s most important natural resources to the Soviet Union in payment of war debts. The poor economic situation was reflected in the high-level quotas of agricultural produce that peasants were expected to deliver to the state, the low incomes of workers, food shortages and high prices for basic commodities. The abolition of rationing in 1954 reduced further the purchasing power of urban consumers. All these grievances were well known by the Romanian leadership at the time of the Hungarian revolt. One of Securitate's missions was to keep under control and inform on the public's state of mind. In addition, several months earlier, a campaign of control was launched in academia targeting the situation of hostels and canteens, and the reports signalled a lack of accommodations, the poor state of existing buildings, and unsatisfactory food at the canteens. But who was there to care? Dej and his henchmen who visualized themselves, like all the Communists in the satellites countries, as being far above the ordinary people only because their cries could not reach the ears of the repressive organs? Last but not the least, this lack of interest in resolving people's hardships fueled the general anger with a government composed of Kremlin-sponsored Communists who did not renounce Stalinist rule even after Khrushchev's famous ‘Secret Speech,’ and when the party, as a consequence, showed confusion in implementing its policies. The presence of Soviet troops could not but to add insult to injury, especially when officers and their families occupied the most beautiful buildings in many towns. In Romania, the initiative was taken by students of the Art Institute in Cluj-Napoca, who gathered, on 23 October, around 300 students in the hall of their faculty to express solidarity with their Hungarian fellows. At the same time, they asked for the removal of Marxism and Russian language classes from the curricula and for an adjustment of the scholarship system by removing the requirement for an assessment of students’ material circumstances, which limited the number of scholarships. They called for a demonstration to be held on 28 October in Victor Babeş Park. At the same time, a Manifesto was written containing requests such as for the creation of a free, democratic student association independent of the party central organs and connected with similar western organizations, academic autonomy and the abolition of compulsory attendance. At the same time, the regime tried to keep potentially dangerous unrest from erupting into disorders. Measures were taken to avoid any further dissemination of the truth about what was happening in Hungary. In agreement with Protocol No. 55, issued by the Politburo of the Central Committee on 26 October 1956, border controls between Romania and Hungary were strengthened and a temporary suspension of the return of Romanian citizens was introduced together with measures to prevent tourists from entering and leaving the country for a short period of time. The Ministry of Internal Affairs enforced military oversight of the Băneasa, Țâncăbești and Bod radio stations. All press releases and radio broadcasts on the events in Hungary were now to be carefully scrutinized before publication. The Protocol also stipulated that meetings were to be held in factories, offices, university faculties and cooperatives to ‘explain’ how ‘groups of hooligans, reactionary and fascist forces are threatening the achievements of the Hungarian workers,’ and that necessary measures were to be taken to improve the food supply, especially in towns. The Ministry of Internal Affairs was ordered to arrest people only with the approval of the party leadership, and the party was to be informed about these cases within 24 hours. At the same time, measures were taken for the release of those students who had been taken into custody for making ‘hostile’ comments against the Communist regime and the Soviet Union in the broader context of the Hungarian revolt. They were to be transferred to the care of the City Committee of the Union of Workers Youth, where they were to be disabused of their ‘unhealthy’ attitude. Even the collection of compulsory quotas that the peasants were required to deliver to the state was ordered to be made as tactfully as possible, ‘using especially political persuasion,’ as the Protocol set out. In the city of Timișoara, following intense debates, three students – Muțiu Caius, Stanca Teodor and Baghiu Aurel – helped by some of their colleagues and close friends from the Faculty of Mechanical Engineering succeeded in gathering around 2000 more students from the Polytechnic Institute, the Faculty of Industrial Chemistry, the Faculty of Medicine, the Faculty of Construction, the Agricultural Institute and the Pedagogic Institute at a meeting that took place on 30 October 1956, at 2.00 pm. In front of the Deputy Minister of Education, Coriolan Drăgulescu, the Minister of Labor, Petre Lupu, and alternate member of the Central Committee, Ilie Verdeț, who were all in town at that time, the students asked for explanations about what was happening in Hungary and demanded solutions to their problems relating to the limited number of scholarships, the lack of accommodations and the poor quality of food in student canteens. They also asked for the withdrawal of Soviet Red Army troops from Romanian territory, an increase in workers’ wages and an adjustment to the quotas of agricultural produce that peasants were required to deliver to the state. A Manifesto was also prepared beforehand by the initiators with the intention to hand it to the regional party organization the next day. In Bucharest, students from the Faculty of Philology had started openly expressing their discontent over the use of censorship as early as September 1956 but a protest meeting planned for 5 November 1956 in University Square in Bucharest had been arranged only two days earlier. The intention was to raise issues similar to those posed by the students in Timișoara and, in addition, to request the release of several colleagues who had been detained a few days earlier for sending a note to the official student newspaper Scânteia Tineretului (The Spark of Youth) asking for changes in its editorial policy and claiming that many commentaries in the Romanian press did not tell the truth about what was happening in the Hungarian uprising. Information about the planned protest spread rapidly among students at the Faculty of Medicine, the Architecture Institute, the Institute of Theatre and Cinematography and the Faculty of Law. However, towards the end of October, the first signs of what was to follow began to appear. According to CIA files, Gheorghe Gheorghiu Dej, then First-Secretary of the Central Committee of the Romanian Workers Party, was ordered to come to Moscow from where he returned on November 4. During that time, CIA analysts noticed that the anxiety of the Romanian leaders was replaced by a relaxed attitude of confidence which demonstrated that they had been informed about the preparations for military intervention in Hungary. Romanian propaganda started to show how the Hungarian workers were ‘helping the army to re-establish social order’ by arresting ‘those criminals who act under imperialist influence.’ The doctrine of the ‘inevitability of war as long as imperialism exists’ had now been revitalized. It seemed that Soviet political thinkers who favored iron-fist action had just won. The Soviets began to build-up their forces and Budapest became almost completely encircled with around 15 mechanised divisions and four infantry divisions. The Protocol’s provisions were followed to the letter. In Timișoara, the organisers were arrested immediately after the meeting, under Decree 199 (1950), which allowed for use of the death penalty. However, the sentence would be changed a day before the first trial which took place on 14-15 November, 1956, instead the students were charged under Article 237 of the Criminal Code that provided for up to ten years’ imprisonment for ‘public agitation.’ Other students were taken to the military garrison in Becicherecu Mic or to a unit in Timișoara. They were interrogated for three days about how they had found out about the meeting, how they had gotten to it and next to whom they had stood in the hall. In the days that followed, other students were taken from their hostels for interrogation. They were all eventually released, but not before being forced to sign declarations that they ‘disapproved’ of their colleagues’ actions and that in future they ‘would be more vigilant’ and take steps to prevent any similar movements from happening again. The terror continued into 1958. Virtually, every evening a car belonging to the secret police stopped on campus in Timișoara and, after ten minutes or so, left with one or two students. Many of those detained were individuals who had been released from Becicherecu Mic. Lists of the expelled students continued to be posted at university faculties. These former students were now publicly criticised at open meetings of the Union of Working Youth, where their colleagues had to ‘testify’ to their ‘inimical behavior’ and to ask for their expulsion from the union. In Cluj-Napoca, several students from the University Bolyai in Hungarian language were similarly detained in 1957. They were placed on trial alongside the initiators of the 23rd of October protest and others who had already been arrested for wearing black ribbons and taking flowers to the graves of Magyar writers on 1 November 1956, the ‘Day of Deaths’ celebration. The purpose of the arrests and the trial was again to attach a revisionist interpretation to the 1956 student disturbances. In 1958, the accused were sentenced to up to seven years in prison for ‘public instigation.’ In 1959, those now charged were subject to an even more severe sentence of up to 20 years’ imprisonment for the same ‘crime.’ In Bucharest, the state organs took the decision to review some of the cases of students who had been identified as engaging in ‘hostile’ activity during 1956 in the interrogation reports of their colleagues already under arrest. Those found guilty would be also sentenced to imprisonment. The real effect of the students' movements was that, for the first time after seizing power in 1948, the Communists realized that something had to be done to maintain that power and, moreover, to show the world that Socialism as a system functioned even in an environment marked by strong anti-Communist and anti-Soviet sentiments in the Satellites. In addition, the Soviet intervention in Hungary affected the USSR's prestige worldwide as coordinated surveys in 1957 in Great Britain, France, West Germany and Italy – the usual Barometer countries – also show. The timing of uprisings in the Socialist camp could not have been worse, taking into account the Soviets' interest in exploiting the window of opportunity opened by the Suez crisis and filling the void created in the Middle East by the unfolding war. This was not a good moment to show weakness in front of the ‘imperialists’ either. Moscow's wishes, transmitted to all the Satellites, explain the Romanian attempt to minimize the social disturbances by changing overnight the initial death sentence for protesters to imprisonment for up to eight years - an unprecedented decision. It also explains why Moscow was so keen to start amending the contracts negotiated with the Satellites under the duress of 1945-46 following the war, and to charge higher prices for their exports that could allow them to make improvements in domestic living standards and avoid further turmoil. Romania also received a modest economic assistance, compare with Poland, through credits for wheat and forage, technical aid for chemical and oil industries and the postponement of old loans. However, the economic loss involved by the outcomes of this policy had to be somehow covered and a reduction in the Soviet military presence would be the solution that would follow in 1958. The withdrawal of Soviet troops could not significantly alter strategic thinking anyway since they remained stationed around two hours’ distance from Bucharest. 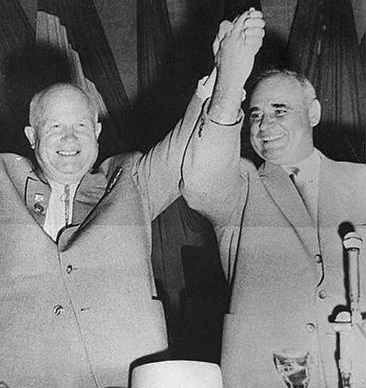 Historians are still debating the reasons that prompted Khrushchev to change his mind overnight and to move from a ‘peaceful path’ to a ‘military path’ at the end of October. Concerns about the unity of international Communism were advanced, with the influential Italian Communist leader Palmiro Togliatti and, most importantly, with Mao urging ‘the restoration of order.’ But did Mao press Khrushchev only in those specific hours or did he support a harder line days before? Another factor to consider is the 'Suez crisis,' with Khrushchev's words from Politburo member Vladimir Malin's notes being used as evidence: ‘If we depart from Hungary, it will give a great boost to the Americans, English and French – the imperialists. They will perceive it as weakness on our part and will go on to the offensive ... To Egypt they will then add Hungary.’ What if, in fact, Khrushchev as well as the other Communists around him were determined from the beginning to go towards the military path and all these talks were only for the sake of the record? They all knew what the revolutionaries' success could mean in terms not only of losing power but also their freedom, if not their lives. They had all been Stalin's trustworthy men in the period of the great purges and had witnessed the fate that had befallen their colleagues – a factor that, for sure, was not eliminated from the equation. Source: The National Security Archive, Soviet Flashpoints, Box 47, Research and Reference Service – Report No. 42, West European Public Opinion Barometer, “The Current State of Soviet Prestige in Western Europe – With Some Evaluations of Western Policy on Hungary,” January 8, 1957. “Working Notes from the Session of the CPSU CC Presidium on 31 October 1956,” October 31, 1956, History and Public Policy Program Digital Archive, TsKhSD, F. 3, Op. 12, D. 1006, Ll. 15-18ob, compiled by V. N. Malin. Translated for CWIHP by Mark Kramer. http://digitalarchive.wilsoncenter.org/document/117064. Corina Snitar is a Ph.D. candidate in Central and East European Studies at the University of Glasgow.